Canada has recalled over 21,900 Galaxy Note7 smartphones after receiving a report of the overheating of the battery of one phone. The Samsung Note7 smartphone battery has the potential to overheat and burn, posing a potential fire hazard, Health Canada, a Canadian federal government department said Monday. The problem with the lithium-ion batteries may, however, turn out to be more serious in the U.S. where already reports of over 70 cases have been received by Samsung, according to the Canadian agency. The U.S. Consumer Product Safety Commission, which is charged with protecting the public from the risk of injury or death linked with certain consumer products, said Friday it was working on an official recall with Samsung but there has been no formal announcement yet of the move. An official recall will make it illegal to sell the phone, lead to government oversight of the replacement program and provide clear guidance to consumers, said Consumer Reports, a consumer advocacy group. CPSC has advised all users of the Note7 to power down the phones and stop charging or using the device. Samsung, which reported a battery cell issue on Sept. 2, has also advised people to power down their Note7 phones and exchange them. There have been accidents that reports said could be traced to exploding Note7 devices. The New York Post reported Sunday that a 6-year-old boy in Brooklyn suffered burns after a Galaxy Note7 smartphone blew up in his hands, while he was watching videos. Samsung, while announcing the problem with the Note7, said there had been 35 reports worldwide as of Sept. 1. “Consumers should immediately power down the recalled Samsung Note7 smartphone and register as soon as possible for the Canadian Product Exchange,” Health Canada said in its statement. It said the recalled phones were sold in the country from Aug. 19 to Sept. 1 this year. Samsung has confirmed working with Health Canada and said the terms of the recall will be announced as soon as they become available. The company could not immediately be reached for confirmation of the over 70 incidents in the U.S. reported by Health Canada. 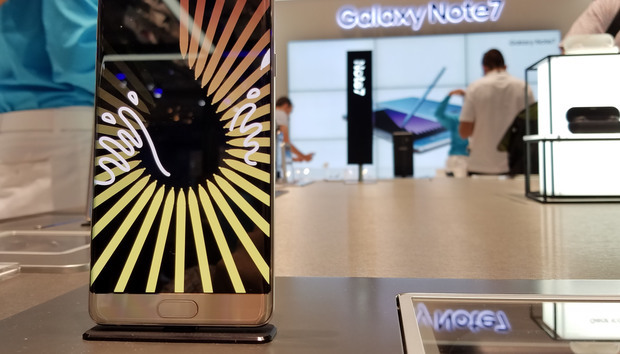 The company has offered to replace the phones with newer ones, but there is uncertainty in the U.S. as to when users will get a new Galaxy Note7, as Samsung said this part of the exchange program will depend on when the CPSC process will be completed. CPSC is meanwhile looking into whether a replacement Note7 is an acceptable remedy for Samsung and phone carriers to provide to consumers. Samsung has offered to exchange the Note7 with the Galaxy S7 or Galaxy S7 edge smartphones and to replace any Note7 specific accessories, with a refund of the price difference. It also offered loaner phones to those wanting to wait for new Note7 devices.